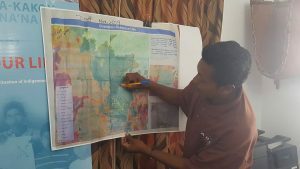 Former Toshao of Chenapau, Sylvester Joseph pointing to one of the areas where residents were arrested, away from a mining area that he said is outside the boundary of the Kaieteur National Park. He denied that the now released residents had violated the laws against mining in a protected area. “No law was broken by our people. We didn’t break any law,” he told reporters at the Amerindian Peoples Association (APA). Fellow former Toshao, Sylvester Joseph pointed to several locations on a map where the Chenapau residents were arrested on an ancestral trail while returning home on Sunday, May 28, 2017. He said mining is taking place outside the boundary of the Kaieteur National Park. “At this moment, we have evidence to show that where the park boundary is, that is where our people were working- beyond the park board which indicates that our people were not in the park,” he said. The Toshaos stressed that they respect the Park boundaries and preservation of the environment. Centre: Toshao of Chenapau, Edward Mc Garrell flanked by former Toshao, Tony Melville (left) and former Toshao, Sylvester Joseph. 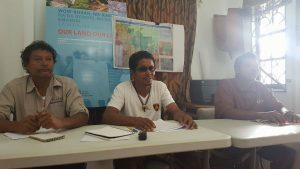 Toshao of Chenapau, Edward Mc Garrell also publicly recommended joint ownership of the Park with governmental authorities to help protect the environment which is closely linked to the Patamona people. “The park will be properly managed because, as it is now, it is not being managed properly because we are the ones, I would say, protecting it all of the time,” he said. Mc Garrell added that the white spots shown in government-released photos are big mining areas below the falls that were once held by Chinese companies that have since pulled out. Mc Garrell further recommended improved communication among the village, Region 8 administration and the National Protected Areas Commission. “Yesterday (Friday) , we had a meeting with Protected Areas Commission and things that we got they don’t have and things that they have we don’t have. We don’t know what really is going on and we are supposed to be friends or partners,” he said. He said Chenapau residents also want to be educated about the laws governing protected areas. The Toshao also denied that the 20 Chenapau residents, who were arrested by police and soldiers last week Sunday, were treated well and accommodated by Protected Areas Commission and the Ministry of Indigenous Peoples Affairs. The residents against whom the government has decided to drop the charges are expected to return by aircraft to Chenapau to be greeted by a welcome home church street. Melville said he and his other representatives would still like to meet with President David Granger.